The NZ Dominion reports this morning that the British Museum has bought Wellington artist, Michael Tuffery's 'Cookie in the Cook Islands', one of a series of his paintings which illustrate fact and fiction around Captain James Cook's exploration of the Pacific. 'Tuffery, 43, of Samoan, Tahitian and Rarotongan descent, said the name of the work used Cook's name as if he was a personal friend. 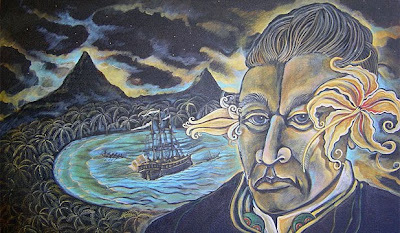 The acrylic-on-canvas work, painted last year, portrays the Yorkshire-born mariner with Polynesian features and flowers in his hair. The Dominion piece, and elsewhere, also report that Tuffery is the first Polynesian artist to have a painting bought by the British Museum. This is indeed something to celebrate, and its good to see the Dominion reporting on this. And congratulations to Michael Tuffery - it looks a powerful work. It would be good to know if it has already left Aotearoa - or is there a chance to see it before it goes to its new home? When it does get there, it will find itself in some proud company. The BM has an outstanding collection of works from both the Pacific in general, and New Zealand in particular. cultural dynamism in the modern world. Among the mini collections from different parts of the world was a set of works from Maori and other Polynesian cultures, and among these are some stunning contributions by the very Maori/New Zealander George Nuku. Nuku's realtionship with the British Museum goes back at least three years, when he was Maori Artist in Residence, 2006. Curiously, I was also lucky enough to see him at work on the last day of his residency. It would seem my London visits are to be book ended by a Nuku connection. And fine that by me! On that trip, he was working inside the Grand Court, Oblivious to the stunned and totally respectful audience, he focused all his energies on a big block of polystyrene which he then transformed into one of his landmark carvings. More recently still, he was also a guest at the New Zealand stand at the recent Venice Biennale. The Big Idea, the local NZ arts portal, did a nice piece on this - and also put up a version of this video, here.